Without further a do, the SE 360 Music Festival is proud to introduce the smoothest event of the summer. The Peaches & Cream R&B Rendition will set precedence for the 9-5 professional looking to unwind from the longest work week. June 20, 2015 at the Calico Room, a new vibe will hit the scene of Wilmington North Carolina. She said she want to let her hair down, put her heels on, and feel a sense of independence while she vibe to the sounds of a live band. He said he wanted chill in an eclectic atmosphere, step out the house fresh, ignite conversations with elevated minds, and taste Caribbean food from a master chef. 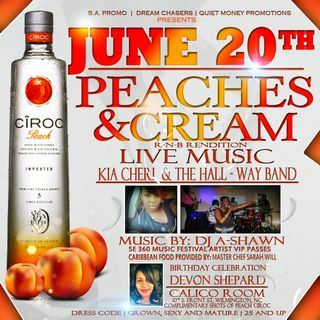 The Peaches & Cream R n B rendition will begin at 10pm to the angelic sounds of Kia Cherie and the Hall – Way band complete with complimentary shots of Peach Ciroc while supplies last to set the mood. The Master Chef Sarah Will, will prepare curry chicken and jasmine rice to satisfy your taste buds. As you walk through the room, acknowledge the peaches and cream decorum provided by Reflection’s of Renee event planning. A special Gemini birthday celebration for Devon Shepard from Woodside, NC. Just in case you need experience behind the turn table, Dj A-Shawn have you covered. To balance the universe, Ike Ellis will host the one of kind event with his normal charisma the world has grown to love. We will see you there. Until then dream big, live strong, and keep progressing.